As one of the leading providers of standard and custom industrial seals in the US, we specialize in designing and manufacturing custom seals, parts and gaskets for mechanical and technical equipment. We also have the capability to create parts for Filling Equipment, Pharmaceutical Equipment and Lab work or other specific applications. All FDA APPROVED. Why Work with SSP Seals? 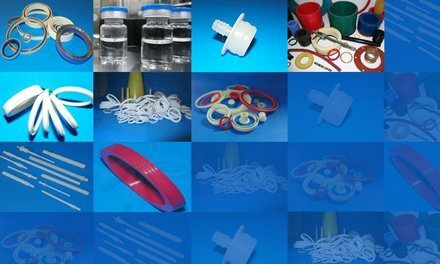 We utilize high grade polymers and elastomers to create pump seals, industrial rubber seals, and wiper seals, u-cups, and spring loaded seals. We work with your sample or drawing, in some cases just dimensions with material specifications. Our standard rotary shaft, hydraulic and pneumatic seals are built precisely to specifications to support application equipment performance. We can create custom FDA approved seals for customers in the Food and Beverage, Food Processing and Pharmaceutical industry. Our water cut gaskets can be made using plastics, and variety of rubbers and sheet metal. We can provide designs for water cut gaskets using Computer Aided Drafting (CAD) and programming software. Our manufacturing systems allow us to replicate used or obsolete OEM seals and components. Our team of designers and engineers have knowledge and experience of working with a variety of materials and applications. This allows us to create versatile sealing products and parts for most sealing solutions. Quality and durability are our main goals. We have the capability to produce custom seals and parts in 5mm and 60ʺ sizes. Our parts are CNC lathe machined. This allows us to provide prototypes and samples within a short time period. A service molders cannot provide. We provide Traceability Certificates for our materials when required. At SSP Seals, we deliver all of our products within short turnaround times and at competitive prices. Our goal is solve your sealing needs quickly and efficiently. Please peruse through webpages for more details. Customers can also look at the application industries list below to understand more about how the use of industrial seals can improve application performance.